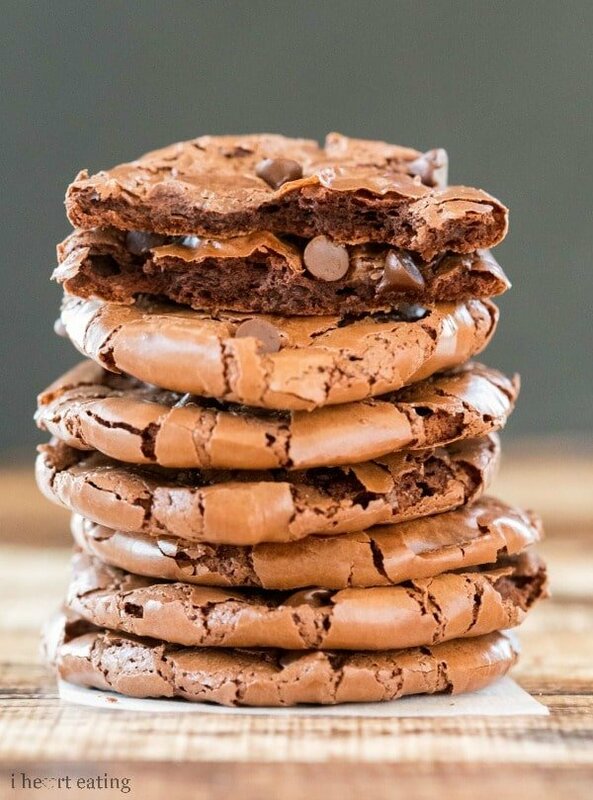 Gluten-free Flourless Fudge Cookies taste rich and fudgy – like the edge of a brownie! With less than 70 calories per cookie, they’re a yummy treat that won’t blow your diet! Raspberries were on sale here. For some reason, when I eat raspberries, I need some chocolate to go with them. I couldn’t decide between cookies and brownies, so I made these Flourless Fudge Cookies. These flourless chocolate cookies are light and crisp at the edges, like meringue cookies. The centers are rich and fudgy like a brownie. And at 68 calories each, these cookies are lighter than most cookies. They also don’t take much time at all to make. I whipped these up while the oven was preheating, and they were ready when it was ready. *Some people have found that they have better luck with 3 egg whites and other people have found that the recipe works better as written. You may want to start with 3 egg whites, and add the 4th egg white if needed. Also, these are flourless chocolate cookies. Please read the recipe description before you make the recipe. I’ve received complaints that they cookies aren’t what people expected because they didn’t read what the description first. The cookies will be thin. The edges are crisp, the middles are soft. The batter is not a thick cookie batter. If you want a thicker chocolate cookie this is the recipe you want. If you’re looking for a softer, chewier gluten-free cookie with add-ins, this is the recipe you want. 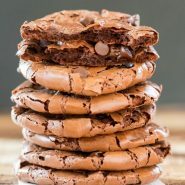 Thin chocolate cookies with crisp edges and fudgy middles. Line two baking sheets with silicone baking mats. This is the set I use (affiliate link). Spray mats with nonstick cooking spray. You can also line with parchment paper. In a large bowl, whisk together the powdered sugar with cocoa powder and salt. Stir in the vanilla and egg whites. Whisk just until the batter is moistened. Scoop the batter by the tablespoonful onto the baking sheets. Leave enough space between each cookie for them to spread (about 2 ½ ” of space between each cookie). Bake for 8-10 minutes, or until the tops are glossy and lightly cracked. Let the cookies cool completely on the baking sheet, and store in an airtight container for up to 3 days. Made these today, as others said, the batter is very very loose if you use 4 egg whites. The original recipe is also incredibly sweet, which you should expect from the ingredients going in. If you did commit to 4 egg whites and are now working with a loose and very sweet batter, you can add another 1/4 cup of cocoa powder, that helped me get to a more scoopable consistency and the final result is similar to the picture above. The cocoa also cuts through some of the sweetness. The end result, after adding the additional cocoa powder was pretty good, with a brownie gooeyness in the middle. I do think that this recipe could be better if the quantities were in grams instead of cups…with baking, cups have very different results, which may be where the issue comes from in this recipe. Thank you for your notes! I’ve been working back through my recipes to add measurements in grams and plan to add those measurements to this recipe as well. I made these with 3 egg whites instead of 4 and about 2/3 of the vanilla (the last of the bottle), and made them a bit smaller than yours (I got 42 cookies instead of 34). Baked for 8 minutes, and some of them needed the extra 2ish minutes to not be mushy in the middle. My roommates loved them, but they’re a little too sweet for my taste. Do you think I could substitute some of the powdered sugar for more cocoa powder? Fantastic! Cookies were great. Thanks! Complete fail. Gooey thin and don’t hold up! Most other flourless have egg whites and 1 egg, and cornstarch. They fold in the whipped egg whites. Thus recipe is missing something. Batter tastes great but can’t serve that. so i don’t have time to read through every comment, but my cookies totally were flat, not fluffy at all and middle was super gooey. the taste was great but i can’t even get them off the pan and my nonstick liner! i didnt cook them all, luckily, is there a way to save the batter? add something to it to keep them fluffy? i did use liquid eggwhites which was 3 T equivalent to 1 large egg white. so i’m sure they are too runny, but i can’t fix that now. any suggestions would be great!! I’m sorry to hear that! The cookies should have a chewy/crisp texture – kind of like the edge of a brownie. Someone said they baked them in a muffin tin and that worked well when they were having issues with runniness. You could also try addING more powdered sugar and cocoa powder to thicken it up a bit. Good luck!